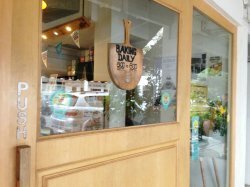 i say – this tiong bahru bakery really crowded! 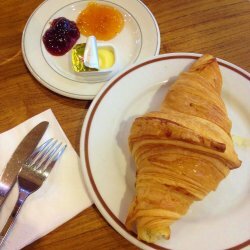 must say that the plain croissant is one of the best i had. flaky outside soft inside & nice buttery flavour. 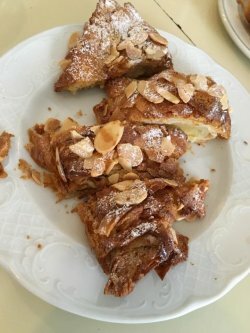 not so hot on the almond croissant. there were some promotion …i think its about S$2.50 each. and the coffee is good here! pastry stuff not top of my list, but i quite happy to have a nice cuppa & chat with good friends. ambience wise it is no better than any of the good coffee places. 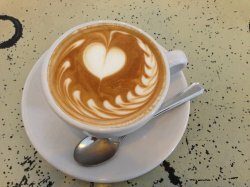 The outlet here, unlike its other two in the city, is really a full-fledged cafe with ample seating and brown-hued interiors. The setting is pretty relaxed in feel, making it pretty ideal for a nice chat over coffee. It was about 75% packed on the Friday afternoon we visited and remained so for the entire duration we stayed. 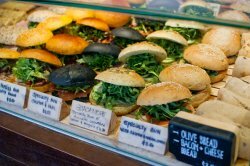 There are no all-day brunch or the usual meal mains, but the substantial sandwiches and pastries more than makes up for it. This coffee owes its origin to beans from 40 Hands. With that, you know it definitely won't be anywhere near bad. 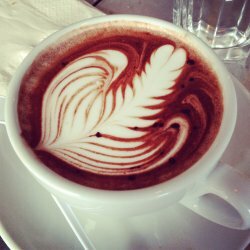 The mocha here is for those who like their mocha with less of the chocolate flavour and more of the coffee. I like it the other way round, so this was just alright for me. This was part of the lunch set on promotion. For $9.90, you get a choice between Bacon and Mushroom Curry or the Salmon and Cream Cheese Panini, accompanied by a side salad. Since I was indifferent and my friend a bacon lover, we got the former. 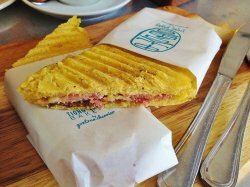 The panini was slightly doughy in texture, like a thicker kind of flatbread. It was a little unusual for a sandwich bread. While my friend found it very weird, it didn't affect the taste much for me. There was nary any curry to the filling, and it was just alright, not fantastic. The accompanying salad with generous flakes of cheese (parmesan?) was good. Its awkward-to-pronounce name (Queen-ah-mann) aside, I have a soft spot for the original Kouign Amann. It is up there on my list of penultimate favourite pastries, so this trip was made in mind to try out the newly-launched version with a 'local' twist - Gula Melaka Kouign Amann. The Gula Melaka, though present, wasn't very apparent. Still, this was excellent because it is just like their original. Same crispy, caramelised edges, with soft and buttery textured layers within. Not sure if I would pay the extra dollar for the Gula Melaka and Coconut again, but the Kouign Amann? Anytime. Bottom-line: No harm trying for the twist, but the original will do otherwise. The most popular of their crumbles, according to the staff. 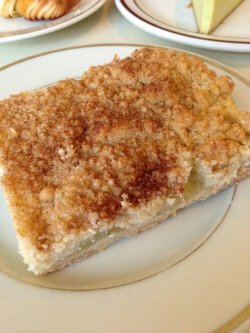 This was crumbly in every mouthful, and the layer with the apple was sweet to a right note, I am not a crumble person, so I couldn't tell, but judging from its popularity and my alright-ness with it, this is probably a good choice if you love crumbles. They do have other flavours too like pear crumble and. The portion is huge and enough for 4 to share as a dessert. We were 3/4 full before this and couldn't finish it between the 2 of us. 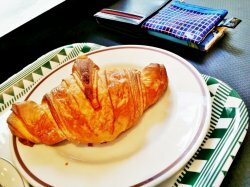 This was had on another separate weekday morning at the Tiong Bahru Bakery Outlet at Tangs. It is pretty therapeutic to sit in the store and watch the day bustle for that 20 minutes while having your pastry. You can help yourself to the marmalade, butter and complimentary water at the side too. 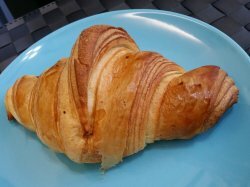 The croissant was crispy outside and the twisted layers gave way to an inside that was a nice balance between substantive and light. I like that it wasn't greasy too. 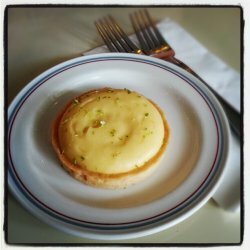 There are a few more pastries I want to try (like the pretty raved-about Lemon Tart). It will take me a few more trips before I can cover it all, Prices are about on par with most artisan cafe-bakeries. As far as it goes, I would give my nod for its pastries. 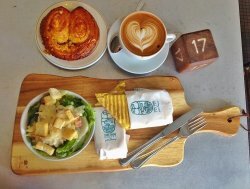 Recently Tiong Bahru Bakery has organized a contest online in Facebook. And I am lucky to be one of the 10 winners with a prize of the new trio Kouign Amann Gula Melaka. Happy with my win, I inform the staff about a week in advance through email about my collection date. 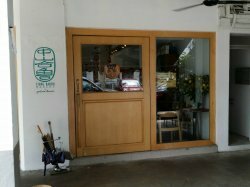 The outlet is just walking distance from the Tiong Bahru Market with a cute huge push door. At the counter, I explain to the staff that I collecting the pastries as a Facebook winner, while showing her the email through my mobile phone. I have told that I will be collecting 3 pieces of pastries free but she is firm that it is a 1 for 1 promotion. Meanwhile my mobile phone is passed from one staff to another. Finally there one staff who knows about the Facebook contest, served me. So 3 pieces of the new trio Kouign Amann Gula Melaka are been packed into paper bag to go. After this long confrontation with the staffs, I have lost my appetite to dine in there for breakfast. I do not think that I will be coming back to this outlet in the near future. Although each of the new flavoured Kouign Amann tastes great in their own ways, I still prefer the original Kouign Amann with its crispy and sweet caramelised texture. 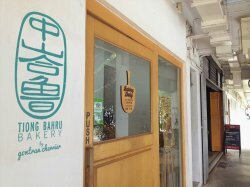 Named for its first outlet located in Tiong Bahru, in the south of Singapore, Tiong Bahru Bakery is actually a French / France style artisan bakery, founded by master baker Gontran Cherrier, operating under the Spa Esprit Group. 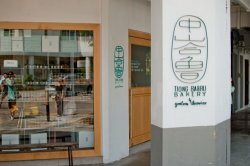 With a wide variety of freshly baked premium qualtiy breads and pastries, and a quirky combination of Western and Asian influences, Tiong Bahru Bakery has won rave reviews from diners. Ambience at Tiong Bahru Bakery pays homage to the Singapore Coffee Shop, with furniture resembling the wooden ones of old. 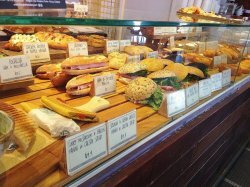 A wide and bright display case lines half the store, displaying all the baked goodies available, while a coffee machine sits to the side, with its whooshing and whistling sounds. 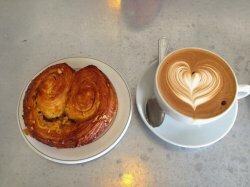 Service at Tiong Bahru Bakery is largely self-service. There is no menu to speak off, you simply browse the display, pick out the items you want, then pay at the cashier. On occasion, staff do serve your order to the table if a short preparation time is required (mostly for drinks). 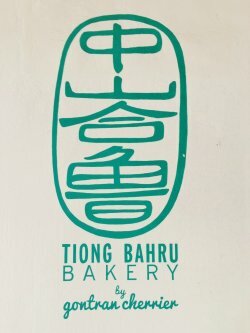 Still, I find staff at Tiong Bahru Bakery to be friendly and relatively knowledgeable about the breads and pastries available. 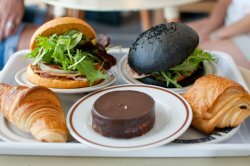 While there are no main dishes at Tiong Bahru Bakery, this is made up by the over 50 breads and pastries, freshly baked daily, ranging from savoury to sweet to staples. There are usually a range of sandwiches or burgers available as well. 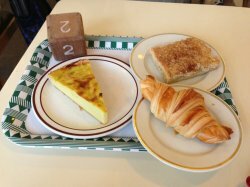 Portions sizes at Tiong Bahru Bakery are decent, and for a premium artisan bakery, I find prices to be relatively competitive, similar to a typical cafe elsewhere. 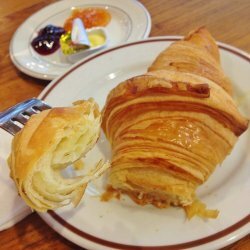 Said by many to be the best Croissant (SGD $2.90) in Singapore, this is light and buttery, with a crisp, flaky exterior. 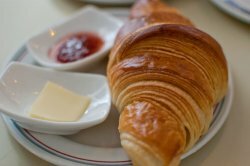 But as you get to the center, the Croissant gives way to a soft, chewy dough texture, making it a delight to eat. Even eaten plain, this is among the better ones! 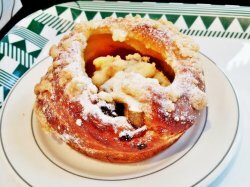 The Apple Raisin Brioche (SGD $4.20) has a soft, fragrant dough, surrounding a sweet center of warm apple slices, studded with raisins. 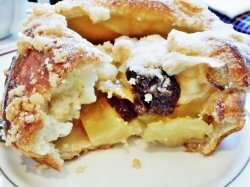 Not too overly sweet, the freshness of the apples complemented the soft, sweet dough. Very good as a dessert! Get both Western style, and Singaporean style coffee here! 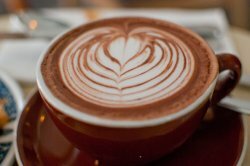 The Mocha is rich and fragrant, with a deep chocolate flavour, while the Magic is best described as Kopi Gao (literally means 'Coffee Thick', which is a double shot coffee with condensed milk). Happened to be around Tiong Bahru area and decided to check out what's the hype about. Given such a traditional name "Tiong Bahru Bakery", I was astounded when i stepped into the bakery as I swing the flipping doors opened. It was a artisan bakery, as noisy as a market place and fully packed with people enjoying their breakfast on a Christmas morning. I never thought that croissant with layers well defined in such ways. The folds were distinctively and neatly done with layers stacking. Its looked dry unlike the glossy and fraglie looking croissant we had but seemed more sturdy and "unbreakable" to me. The crossiant was crisp and aromatic, fill with butter fragrance but not oily at all. Its flakiness had been in a control manner such that every bite would not had them drop off too much. Another scene stealer, Kouign Amann Choco, which is a breton cake. 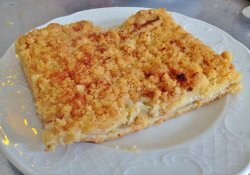 It is a round crusty cake made up of bread dough with layers of butter and sugar folded in. 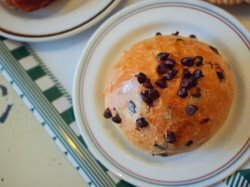 The added choco had made this pastry more sinful than ever however its worth the calories. 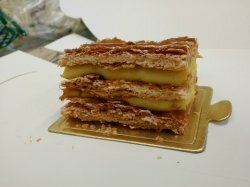 Vanilla Millefeuille which is made up of 3 layers of puff pastries, alternating with 2 layers of cream. A perfect combination which blends the roughness of crisp and smooth cream layers well as we sink our teeth down. Not forgetting its Berries Crumble, which was decent as well. If you dislike the taste of apple pies or tarts, this is probably not for you. 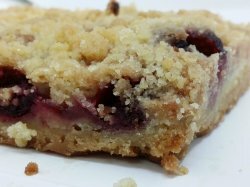 The blended mixed berries were a combination of sour and sweet topped with the crisp crumble. The serving was generous, remember to share. The pastries had hit me on the right spot, if I had knew it was an artisan cafe instead of the traditional old school bakery, I would definitely have my breakfast here. Nevertheless, let's plan for the next trip! I will be back for more flour! 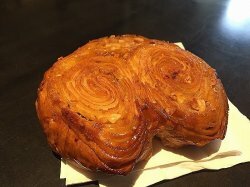 Kouign Amann - A comfort food to die for! 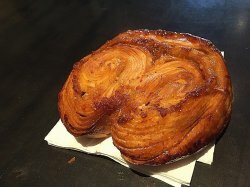 When I took my first bite of the Kouign Amann (pronounced as kween a-mon), I was totally blown away. 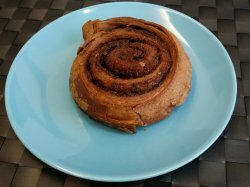 It looks like a cinnamon pastry roll but it is actually a Breton cake made of plain flour dough, folded multiple times with plenty of butter and dusted with loads of sugar. 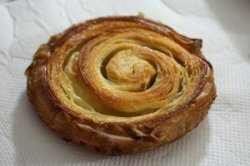 In French, ‘Kouign’ means cake and ‘Amann’ means butter so it’s very much like a crusty layered bread cake. When it bakes in the oven, the sugar melts between the layers and caramelises at the surface. The kouign amann tastes so crispy on the outside yet moist and sticky on the inside. Layers and layers of rich buttery sweet salty flavours. Excellent balance of savoury and sweet. I-S listed this as one of the 50 items to eat in Singapore before one dies. I concur, wholeheartedly. A comfort food to die for with no regrets. After hearing so much good stuff about Tiong Bahru Bakery from my mum, my family finally went down on Sunday to the first outlet for breakfast. The dining space inside the bakery is a bit crammed and I heard many "excuse me"s as people tried to navigate their way around to/from the queue and tables, but it didn't affect me much because I was here for the food and the food was good. I started my meal with a simple cup of Hot Chocolate which was already sweetened. The chocolate was not very thick (or dilute) and it wasn't too sweet either. 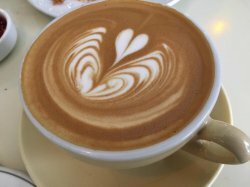 The "latte" art was also pretty. I got a mini croissant ($1.80) since it is supposedly the best in town, and it was. 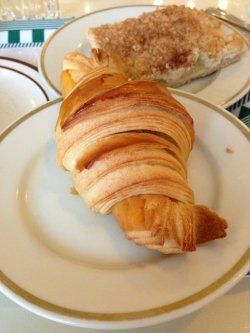 The croissant was flaky on the outside and soft in the inside and it was served warm (it was put in the oven for a while before serving). The butter flavour was also not overpowering. I wish I ordered the larger one because I simply wanted to have more. I also got the cereal burger with ham and cheese and it was delicious. 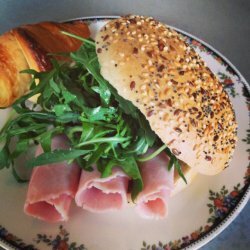 They were generous with the ham and although there wasn't any sauce in the burger, the strong salty-sour taste of the cheese, the mild wild rocket, cold ham and fluffy cereal buns came together nicely such that it wasn't too dry or too bland. I need to make a trip down to Tiong Bahru during one of the weekdays to do some admin work. As the Tiong Bahru Market was closed for cleaning up on the same day, I then decided to have my brunch at Tiong Bahru Bakery. This was my first time dining in here, but on my own. Push open the heavy wooden door to get entry to the cafe. These buns were so pretty to look at! The front three buns reminded me of "Pac-Man", with the mouth open. Haha... Which buns caught your attention the most? 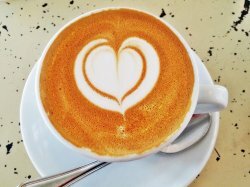 I had a cup of flat white ($5.50) and was very pleased with the very defined coffee art that they had for me. The heart shape was very nicely done. Some of my friends who saw this said it was gross! 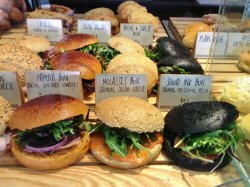 The Squid Ink Bun! There's lots of greens in the bun, together with smoked salmon and ham. It was quite nice but of course, the saltiness of the smoked salmon overwhelmed the taste of the squid ink bun. How does squid ink taste like? I Dunno! LOL! My nice brunch of the day in a very comfortable setting. It is my first time going to this outlet and it is air-conditioner because the weather is warm!They got ample seats and enough for the amount of crowd in the shop. 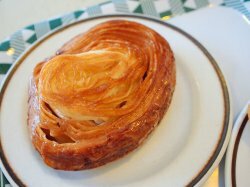 Ordered for this sea salt caramel laced pastry which is about $3+. 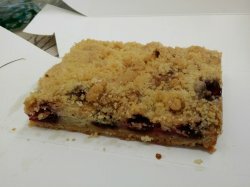 I find that the taste is a little bit sweet for my liking but the texture of the pastry is good. It is because the pastry is still warm and crispy. It is well match with a cup of coffee! I will try the other pastries that are available over there. 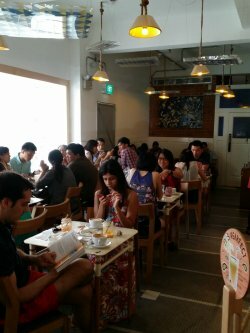 It was my second time to Tiong Bahru Bakery at Eng Hoon Street and it was bustling as I would assume it to always be, so we settled for a table in the serenity of the empty corridor but later shifted in just so I could get pictures of the interior. Despite that, it wasn’t the best setting for me to point, focus and go clickity click because the tables were so cramped and it was always so crowded with customers queuing to make their orders. 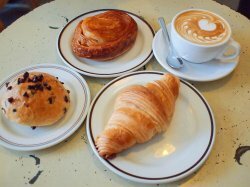 What we had: Chocolate Brioche, Plain Croissant, Kouign Amann & a Flat White. 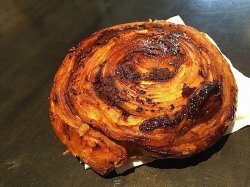 I believe the Croissant to be a must-try for anyone who hasn’t, but the Chocolate Brioche faded into the background for us, probably because of the star-studded Kouign Amann. 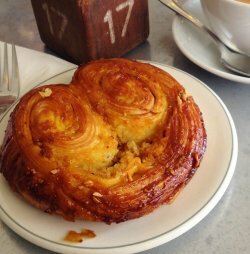 I’d never heard of Kouign Amann prior to my visit to TBB. Yet, one bite was all it took for it to climb up my list of favourite pastries and is now hovering near the top where the lemon tart sits in its throne of glory. Do not belittle its seemingly plain exterior. Bite through the crusty layers and you’ll the discover happiness that is the whiff and taste of butter. Sugar is caramelised over the entire Breton cake and it gets a little messy when a thousand crumbs fall upon every bite. You will however, not have a care because you’re too busy savouring what seems to be one of the best things you’ve ever tasted. It must either be a torture or a pleasure to be living in the Tiong Bahru neighbourhood with a bakery like this in the premises. Not forgetting other cafes in the area like The Orange Thimble, Drips, 40 Hands etc. We’ll be back, hopefully soon. 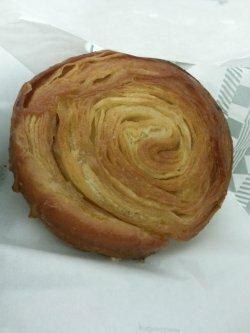 And I will get another Kouign Amann. Touted as one of the best bakeries in Singapore at the moment, the man behind this very successful artisan bakery is none other than one of Paris's most celebrated bakers- Gontran Cherrier. Situated right next door to The Orange Thimble, this bakery stands humbly and inconspicuously, as it fits right into the neighbourhood with its white-washed walls, light brown wooden frame borders and single swinging entrance door. Tiong Bahru Bakery is a collaboration with Spa Esprit Group, who currently already have Forty Hands and Open Door Policy under their belt, which are also conveniently just located a few blocks away. 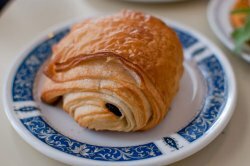 It is said that all the loaves, bakes and especially their signature croissants that have had everyone talking about, are baked on site using traditional French techniques which have been very meticulously adjusted and adapted for the humidity in our country so that Singaporeans are still able to enjoy the freshness and full flavours of all his bakes and pastries despite the weather! 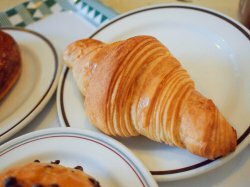 Starting with the Plain Croissant at $2.50, the first thing that I was drawn to, was how beautiful and intricate the layers were. Clearly, only true skill and experienced hands in the laminating process could have produced this end result. One bite into this crescent-shaped baked dough and I was sold. It was fluffy and delicious even without a spread of butter. Additional points for the absence of the heavy after-feeling of eating a croissant because this was not oily at all and crisp on the outside without being too flaky. Definitely felt less guilty eating this one! The Chocolate Croissant $3.20 was up for tasting next. 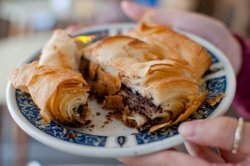 Another work of art and display of skill, this chocolate croissant was not your regular pain au chocolat with its distinct rolled layers and varying shades of brown while maintaining its iconic cuboid shape. Cutting into this baby and watching as the brown melted chocolate began to stain the butter knife, was a mouth-watering experience. With just the right amount of chocolate added to the viennoiserie while still maintaining its softness and texture, it's no wonder this chocolate croissant is such a favourite with customers! 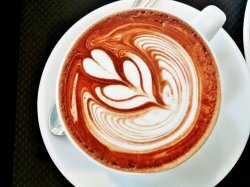 But of course a cuppa of Hot Chocolate $4.80 with such beautiful latte art always makes my day. 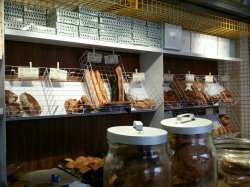 It's great that Gontran Cherrier has chosen Singapore as his first venture outside of France for which we have authentic French loaves and buns at our backyard without having to buy an air ticket. 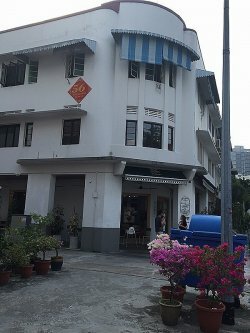 Finally went to the all time famous Tiong Bahru bakery that's supposed to be legendary and had positive reviews from many critics. 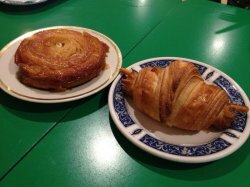 Tried the Kouign Aman (left) and Croissant Orange (right). They taste fabulous. The Kouign anan was awesome and the croissant was crispy and fluffy (buttery yet not too over). Definitely a must-try if you ever have the chance to visit. 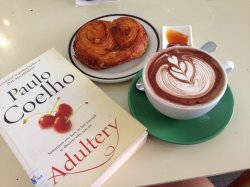 Good to go with a cup of nicely brewed coffee. After hearing much ravings about Tiong Bahru Bakery, I finally tried it since I was in the area. Perhaps, I had too high expectations because the standards of the food totally fell short of it. 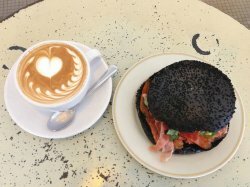 I tried their Croissants, Specialty Squid Ink bun with Salmon and Ham and Lemon Tart. 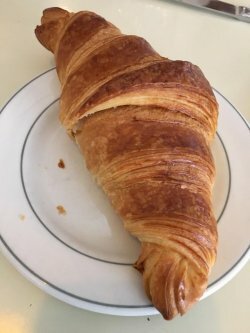 Personally, I like croissants that are flaky and buttery and crispy when you bite into them. 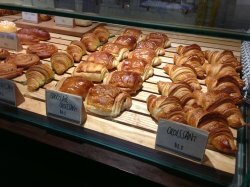 However, the croissants I had from Tiong Bahru Bakery was a huge disappointment. It was dry, soft and totally lacking in crispiness. 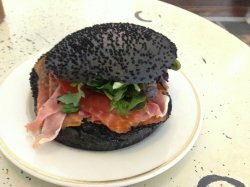 The Specialty Squid Ink bun was far from special. I felt that it tasted just like any other sandwich with arugula, salmon and ham (which is a no-fail combination). 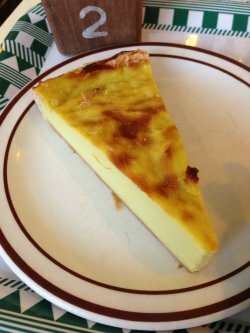 Lastly, the Lemon Tart was very flat in its flavor and just tasted sour. The pastry was soft, yet not crumbly. In essence, the whole tart was just crying out for a tad of sweetness to counter the overwhelming sourness. Overall, a very disappointing experience with Tiong Bahru Bakery. 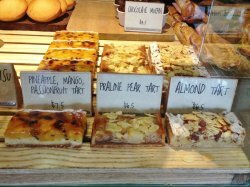 It has just simply failed to bring the amazing taste of French pastry to Singapore. Headed down to TBB because the bf wants to eat a croissant, so I brought him for a bout of pastries! We alighted at outram mrt and took a bus (one bus stop down) and then after walking for about 1-2mins from the bus stop, we saw TBB! My idea of TBB is much bigger and I wasn’t expecting a smaller place. But yet it’s still kind of cosy because they made use of sunlight streaming through the glass wall to inside. But the glass wall extended until midway, thus the lighting at the back was too dimmed for daytime. Opens from 8am till 8pm! 8am is seriously early! 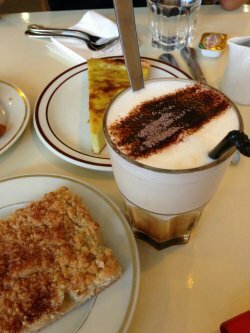 We ordered pandan flan ($6), original croissant ($2.80), iced cappuccino ($7.50) and apple crumble ($6)! Free flow of water at the side, with free flow jam and butter for your bread! It’s our first time eating such a hard croissant. Not very sure how to tell if it’s the nice kind but I guess it is, since it’s buttery. It’s very different from the ones we buy at confectioneries where it’s softer. Iced cappuccino was just normal? I just wanted a cold drink because it was a hot day. It tasted pretty normal. It came with brown sugar syrup as well! Apple crumble was the bomb!! Totally loved it the first bite I took, crunchy! But it’s quite big so I would suggest sharing among your friends. Pandan Flan was…hmm just not our type of pastry. It’s jelly like and I don’t really like it. Would have gotten the squid ink bun with salmon but the bf is not a huge fan of salmon, actually neither am I but it’s rather unique. We spent $22.30 in total, not too bad considering we ordered 4 items, though we were rather disappointed with the pandan flan.